Innovation possesses the power to unite people from all walks of life. March’s IVRC membership meeting proved this principle in leagues. Around forty people shuffled into Idaho’s own local virtual reality arcade, the first of its kind in the state, VR1. Attendees were diverse in their demographics, from teenagers to industry veterans with backgrounds as direct as VR development and as obscure as performance poetry. The room was alight with conversations, sparked largely in-part by the ingenuity filling the room. VR1’s facility is the definition of cutting-edge efficiency. There are five stations, outfitted with HTC Vive headsets and padded floors, in pen-like atmospheres that scream futurism. Above each pen there is a mounted VR1 terminal, streaming games straight to a user’s headset. Employees utilize a succinct communication system to remotely guide users through tutorials and games as needed. The venue is all style, with sound-proofing pads colored black and blue (The company colors) in a cohesive manner that leaves you wondering why more locations don’t have their own VR1 site. The feat is particularly amazing when one considers the master architect behind this novel concept, Brendan Smythe, is only twenty-one. This month’s meeting hosted a panel of local experts on the industry, focused on a theme reflected quite effectively by the venue: Gaming. Black Box VR’s Senior VP of Game Development, Duane Mathes, acted as moderator. Arnold Hendrick (Retired industry veteran), Markus Nigrin (Blocksmith Inc), Jake Overall (Codeworks Boise), and Mr. Smythe all acted as panelists fielding key questions about the industry’s future in concert with the night’s theme. Mathes’s first question was relatively straightforward: What is the most important aspect of video games? Hendrick noted that financial sustainability is a major component, that a game must be able to stand on its own two feet and propel itself forward thereafter. Smythe echoed this sentiment, noting that one has to recognize a need and fulfill it. However, he communicated that it is not solely a capitalistic endeavor. Making money is one thing, but it is usually the result of an honest attempt to meet particular demand. Nigrin and Overall both noted that enjoyment is a major component, particularly for students that are making their own gaming project. From this point, however, the conversation began shifting towards games as an educational tool. 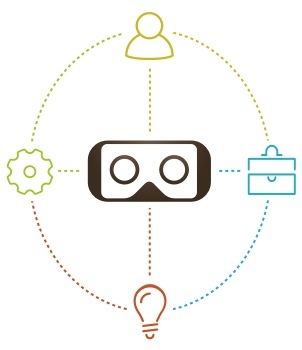 More broadly, the focus began to shift on Idaho as a use-case for demonstrating the transformative effects that virtual reality can have in the classroom and its corresponding effect on intersecting markets. That is to say, children and high schoolers are proving to be an effective demographic for adoption of the technology. So too, educators are finding the tool to have a profound effect on motivating and exciting students to learn. Nigrin noted that his own platform, Blocksmith, has seen use-cases in eight schools already. Broader innovations, such as Google Cardboard, have also been utilized in the classroom to simulate field trips and chemistry experiments. The possibilities are wide. Blocksmith is an instance of particularly high potential, as it allows students to build VR experiences within VR – an observation which left the room quite excited. This conversation gradually transitioned to Mathes’ final question of the night: How will games benefit Idaho in the immediate future? Many of the panelists agreed that art creation will be a major component moving forward, that there is a pronounced demand for local talent in the field. Codeworks CEO, Jake Overall, noted that a local professional based out of Nampa will be teaching a course through Codeworks on the 3D modeling this year. Nigrin, Smythe, and Hendrick focused on the economics of art assets being utilized in the development process. Platforms like Google’s Poly have increased accessibility, but there are still high costs associated with assets that have pre-existing intellectual property rights possessed by a contractor or outside organization. However, this is likely to change quite rapidly over the next five years as more youthful innovators connect with 3D modeling tools. Ultimately, the panel focused in on the fact that Boise stands in a unique position. There is a unique mix of artistic and technological institutions that are slowly beginning to blend into one another more fluidly. If the opportunities to learn skills, such as 3D modeling, are made more widely available there is a chance that the talent shortage in the area may resolve itself. Gaming as a means of demonstrating VR’s potential to help students learn, apply, and cultivate themselves professionally may very well entice state municipalities to incentivize the process. Idaho is home to the first nuclear-powered city, the birthplace of the inventor of the original television set, the possibility that it may be the first VR-powered future city is not at all farfetched. One step at a time, movers and shakers of the valley are coming together to create exciting partnerships. From augmented reality being utilized at Treefort, to Micron’s hand in the evolution of hardware components, the Treasure Valley stands in a moment of astounding opportunity being made into reality one pixel, one person at a time. The IVRC’s next membership meeting will take place the week of April 23rd at an as-yet decided venue. Keep checking out the events page stay in the know – We hope to see you next month! Come join us in the metaverse, it’s only growing more day by day.